Gutbucket are a pure traditional hard rock band from the North of Germany (Hamburg, Kiel). They have been around for nine years and even if the new album is self-titled, it's already their third release. 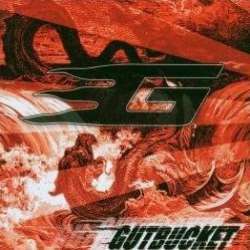 On the one hand, Gutbucket are influenced by late Nineties rock bands from Sweden like Gluecifer and Hellacopters. On the other hand, there's an even stronger retro touch which goes back to bands like AC/DC, Rose Tattoo and the Black Crowes. The opener Short Goodbye is sounding like a southern rock AC/DC cover band and shows the band's intention to play energetic and raw rock which should sound live even more authentic than on a CD. Light Your Fire gives the bass player a dominating role and is a step towards desert rock. Body Go Whooo and You Never are two more tracks showing Gutbucket's admiration of QOTSA. Even if the album is quite diverse, Gutbucket never try to put own ideas into the music. The more melodic Ink Sukka is reminding a lot of David Lee Roth and the album's last track It Started Off Bad isn't too far away from The Cult. Although the lack of originality is a complaint one can make towards Gutbucket, I appreciate that they have nevertheless produced an entertaining rock album. Only Gimme Some Action is sounding a bit too simple, even for Gutbucket. Every fan of the aforementioned comparisons will probably adore Gutbucket as they aren't too bad on a technical and songwriting level. Their music will probably even kick harder after a few refreshing beers.